Rob Melnick is Director of International Programs and Presidential Professor of Practice in the School of Sustainability at Arizona State University. From 2008-2018 he was executive director/executive dean of the Julie Ann Wrigley Global Institute of Sustainability and of the School of Sustainability. Prior to these positions, he served ASU as director of the Morrison Institute for Public Policy from 1987-2008 and conterminously as associate vice president for economic affairs (2002-2008) and assistant vice provost for research (2001-2003). Dr. Melnick also holds academic appointments as research scientist in the Julie Ann Wrigley Global Institute of Sustainability and as affiliated faculty in ASU’s School of Public Affairs. 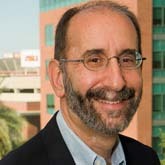 Immediately prior to his work for ASU, Dr. Melnick was a senior fellow and vice president of the Hudson Institute where he was in charge of policy studies on employment and education. In addition to his administrative responsibilities, Rob teaches courses in urban sustainability and sustainability policy. He is the co-author of three books and numerous policy research studies. Rob has a bachelor's degree Dartmouth College and earned his master's degree and Ph.D. from Arizona State University. Shears, B. L., C. L. Redman and R. Melnick. 2009. Global Institute of Sustainability. Estes Park, CO. Poster presented at 14-16 September 20009 LTER All Scientists Meeting, Integrating Science and Society in a World of Constant Change. Melnick, R. 2012. Sustainability and cultural context. Presentation for June 2012, Henkel Corporation Annual Series on Sustainability, Dusselforf, Germany. Melnick, R. 2012. Sustainability and philanthropy. Presentation at the September 2012, Board of Trustees of the Virginia G. Piper Trust. Melnick, R. 2012. Training government officials on sustainability policy making. Presentation at the May 2012 Resileint Cities 2012 Congress, Bonn, Germany. Melnick, R. 2011. Combining technology, financing and behavior to create resilience through energy efficiency. Presentation at the June 2011 Resilient Cities 2011, Bonn Germany. Melnick, R. 2011. Urbanization and sustainability in the country of Georgia: The role of public policy. Presentation at the October 2011, National Librairy, Tbilsi, Georgia. Gammage, G., J. S. Hall, R. E. Lang, R. Melnick and N. Welch. 2008. Megapolitan: Arizona's sun corridor. Morrison Institute for Public Policy, Arizona State University.